Those of you that have a Twitch Prime subscription can look forward to some great stuff in the very near future. You’ll be getting five free games a month with your subscription, to keep forever, starting March 15th. The list for March is Oxenfree, Superhot, Shadow Tactics, Tales from Candlekeep: Tomb of Annihilation, and Mr. Shifty. It’s unknown whether you’ll have to install the Twitch desktop app to access these games. Twitch Prime is really starting to drive a hard bargain. They’ve offered free stuff and other similar perks in the past, but now they’re really doubling down. Yes, you can get Devil May Cry for free, but it’s getting better. 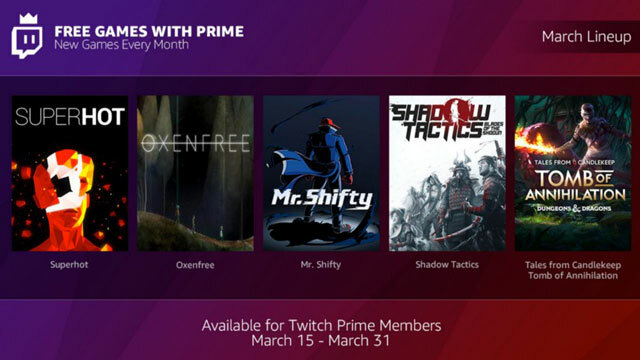 Starting this Thursday, March 15th, you’ll be getting five free games to keep as a part of your Twitch Prime subscription. If you’re wondering what Twitch Prime is, it’s basically just connecting your Amazon Prime account to your Twitch account. So, which games can you get for free this month? From March 15th to March 30th, the list includes Superhot, Oxenfree, Mr. Shifty, Tales from Candlekeep: Tomb of Annihilation, and Shadow Tactics. It’s a pretty diverse bunch. Oxenfree is a moody adventure game, Superhot is a stylish FPS with a cool gimick. Shadow Tactics is a strategy game, Tomb of Annihilation is a strategy RPG, and Mr. Shifty is a 2.5 D beat-em-up. Little bit of something for almost everyone, I’d say. The announcement also details which free games you’ll get in April 2018. The list is as follows: Tales form the Borderlands, SteamWorld Dig 2, Kingsway, Tokyo 42, and Dubwars. So, yeah, as the post points out, that’s ten free games in two months. Not a bad haul. The people behind Twitch Prime will be announcing the games you’ll be getting for free in the coming months in the near future.